The Communist Party of Nepal – Maoist (CPN-M) quit the government as the eight-party leaders failed to create a consensus on its demands on September 18, reports Nepal News. Senior Maoist ministers submitted their resignation letters to the Prime Minister (PM) Girija Prasad Koirala, soon after the meeting ended in a deadlock. The PM has rejected two key demands of the Maoists: the announcement of Republic before the elections and a proportional representation election system. Addressing a mass rally, the Maoist ‘second-in-command’, Baburam Bhattarai said, "Our efforts to declare republic from the parliament has failed. Now we will declare republic from the streets. 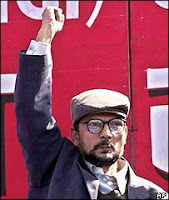 Therefore, we have decided to come in the midst of the people," said Bhattarai. He also rejected the code of ethics and election schedule by the Election Commission and said "We will struggle for the purpose of having real election not this hypocritical drama."